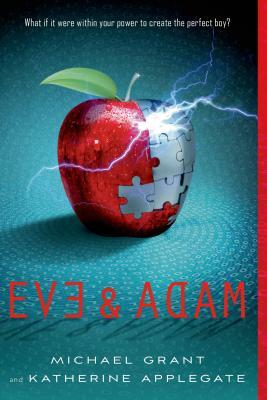 With Eve and Adam, authors Katherine Applegate and Michael Grant team up to create a thrilling story. In the beginning, there was an apple? And then there was a car crash, a horrible injury, and a hospital. But before Evening Spiker's head clears a strange boy named Solo is rushing her to her mother's research facility. There, under the best care available, Eve is left alone to heal. Just when Eve thinks she will die?not from her injuries, but from boredom—her mother gives her a special project: Create the perfect boy. Using an amazingly detailed simulation, Eve starts building a boy from the ground up. Eve is creating Adam. And he will be just perfect . . . won't he? Katherine Applegate is the author of several best-selling young adult series, including Animorphs and Roscoe Riley Rules. Home of the Brave, her first standalone novel, received the SCBWI 2008 Golden Kite Award for Best Fiction and the Bank Street 2008 Josette Frank Award. She lives with her family in Irvine, California. Michael Grant is the author of BZRK and the bestselling Gone series. He and his wife, Katherine Applegate, are also the authors of the popular Animorphs series. They live in Northern California with their two children.